Of all the acknowledged worlds both in our solar system and circling distant stars, Earth is the only planet known to have liquid oceans. And it's probably no coincidence, either, that our world is the only planet we know of that also harbors life. Though we have chosen the moniker "Earth" for our planet, it might be more appropriately named "Ocean," because water covers more than 72% of the globe's surface. The amount of water in Earth's seas is staggering: around 310 million cubic miles (1.3 billion cubic km). The deepest part of the ocean is over 6.8 miles (11km) below the surface, and its average depth is 12,080 feet (3,682 m). -Size: 310 million cubic miles (1.3 billion cubic km). -Average Depth: 12,080 feet (3,682 m). -Maximum Depth: 6.8 miles (11km). -Number of species in the oceans: 700,000 - 1,000,000. -Other: Earth is the only known world with liquid oceans. Scientists are not exactly sure how Earth's oceans were formed. However, they believe that there are several possible sources for the water. Probably some of the water was trapped in the rocky parts of Earth when the planet was formed from material drifting in space. This water could have been in the form of ice or water trapped in a clay-like material. It could have also been in the form of the components of water (hydrogen and oxygen) which were trapped in rock. As the planet came together, it heated up and parts of the early earth vaporized. Some of this vapor formed our planet's atmosphere. Later, some of the water vapor in the hot atmosphere cooled down enough to become liquid, turn into rain and fill the oceans. Some of the water in the oceans, however, may have come to Earth later on in the form of meteorites. In its early years, the Earth was bombarded with many meteorites that carried a significant amount of H2O. A bit later in its history comets, which are basically "dirty snowballs," may have hit the planet also adding to the oceans. Tests of the type of water found in comets and meteorites have shown, however, that comet water is rich in deuterium and meteorite water is rich in xenon. Ocean water has less of both of these materials, suggesting that comets and meteorites only played a minor part in adding to the world's early seas. One thing we know for sure, however, is that our planet continues to release more water vapor into the atmosphere through volcanic eruptions. This water vapor will eventually turn to rain and find its way into the oceans. In turn, some of the water in the ocean will get pulled back in the solid part of our planet as the continental plates under the ocean are pulled back under the surface of the Earth, taking a bit of the ocean with them. Perhaps what is more amazing than just our planet having oceans is that it has managed to keep them liquid over such a long period. This is mainly due to the Earth's temperature. If our planet was closer to the sun, like Venus, it likely would have never cooled down enough for water to become liquid on the surface. Instead, the globe would be like Venus: a hot, dry surface where the temperatures are high enough to melt lead. 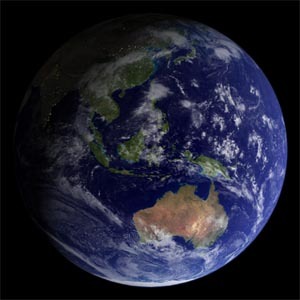 Scientists have found evidence that liquid water could be found on Earth as long ago as 4.2 billion years. 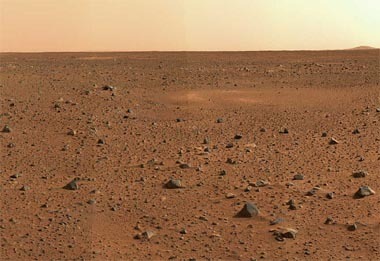 It is thought that Mars might have had oceans in its early history, too, covering as much as two thirds of the planet. As Mars cooled, however, they disappeared. 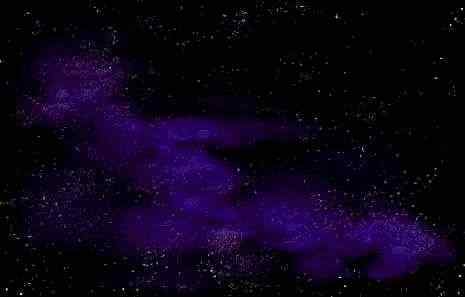 They may have become frozen under a layer of soil and rock, or disappeared into the atmosphere and were eventually lost into space. Today, Earth is the only known planet that has large, stable bodies of liquid water on its surface, though some moons of the outer planets, like Enceladus or Europa, may have liquid water under an icy crust. All life as we know it requires water. This makes scientists suspect that life on Earth may have begun in the oceans. In 1979 researchers discovered the existence of deep sea hydrothermal vents. These vents release hot gaseous substances from underground into the water. The scientists noted that around these vents in the temperate region between the hot gasses and freezing water, ecosystems containing various types of fish, worms, crabs, bacteria and other organisms have formed. They speculate that 3.7 billion years ago these places may have provided the perfect place for life to start. Experiments have shown that heat, pressure and the chemicals coming out of the vents can create the right conditions for the organic compounds needed for life to form. Whether or not life began in the oceans it is clear that the oceans were the home of some of Earth's earliest life forms. Today, scientists estimate that 50% of all life on Earth lives in the oceans. It is the home of billions of plants and animals most of which live near the sunlit surface. Some of the most abundant and smallest life in the seas are phytoplankton. These are typically tiny single-celled, plants that float and drift throughout the surface waters. The biggest creature in the ocean, in fact on the entire Earth, is the blue whale. This aquatic mammal can run almost 100 feet (30m) in length and weigh 170 tons. In between these two extremes there is estimated to be between 700,000 and one million species of life living in the seas. By some estimates two-thirds of them have yet to be named and described by science. Much of sea-life is found in the coral reefs that lie in the ocean's shallows. Coral reefs are underwater structures formed out of calcium carbonate which is secreted by corals. Corals are tiny marine animals that attach themselves permanently to a location as part of a colony of similar creatures. When each generation of coral dies, it leaves behind an exoskeleton on which other corals will attach and grow. Over time these structures can become immense like the Great Barrier Reef that stretches for some 1,600 miles (2600km) along the coast of Australia. 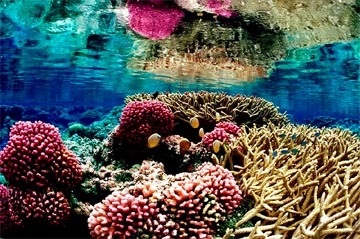 Coral reefs, often referred to as "rainforests of the sea", form some of the most diverse ecosystems on Earth. 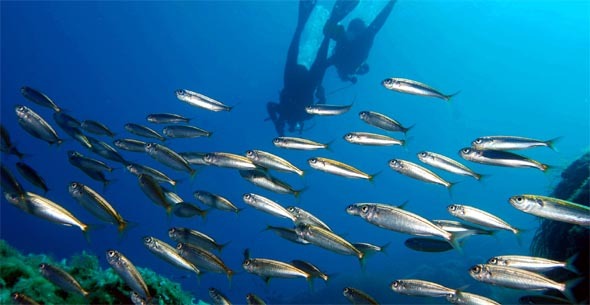 Though they cover only one tenth of one percent of the ocean floor, they support about a quarter of all marine life. While coral reefs with their abundant life mostly exist in the shallow regions of the sea where sunlight penetrates the surface, some marine life can live in its darkest, coldest depths. In fact, a few grow to great size. The giant isopod, a deep-sea scavenger and relative of the tiny, common pill bug, can grow to a length of over 30 inches (76cm) and weigh 3.7 pounds (1.7km). Other deep-sea creatures that live in the dark depths can produce their own bioluminescent light. The anglerfish has a fleshy growth that protrudes from its head. The tip of this limb glows. The anglerfish uses this lamp as a lure to bring curious prey, usually smaller fish, within striking distance. There are five named oceans on Earth which lie between its continents. By size from largest to smallest they are the Pacific Ocean that separates Asia from the Americas then the Atlantic Ocean that separates the Americas from Africa and Europe. There is also the Indian Ocean that lies between Africa, Australia and the south of Asia. Finally the two smallest oceans are the Southern Ocean, which encircles Antarctica and the Arctic Ocean that covers the North Pole between North America and Asia. Because all these bodies of water are interconnected, scientists sometimes refer to them as the World Ocean or global ocean. This term also includes smaller salt water bodes like seas, gulfs and bays. Because water is such a prerequisite for life, astronomers are anxious to see if they can identify oceans on planets beyond our solar system. So far, our instruments are not sensitive enough to see if a planet around a distant star has liquid oceans, but scientists think they have found several worlds that may be the proper distance from their stars so that surface temperatures may allow for liquid water. If this is true, the oceans of Earth, though they are unique in our solar system, might be common in our galaxy. These distant oceans may also harbor extra-terrestrial life.